Mr Trump has previously had a policy of placing "maximum pressure" on North Korea to force it to change course. But he said he did not want to use the term any more "because we're going into a friendly negotiation" but he warned he had many more sanctions he could use against North Korea. Mr Trump also dismissed speculation that US basketball player Dennis Rodman - who has visited North Korea several times and is a friend of Mr Kim's - had been invited to the summit. "I like him. He's a nice guy. No, he was not invited," he said. The Japanese prime minister has held regular meetings with Mr Trump since the US president took office. 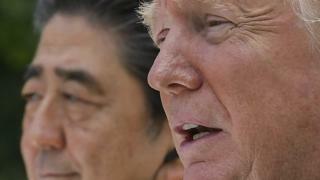 Since the summit was announced, he has been eager to ensure Japan's interests are not overlooked in any rapprochement between the US and North Korea. 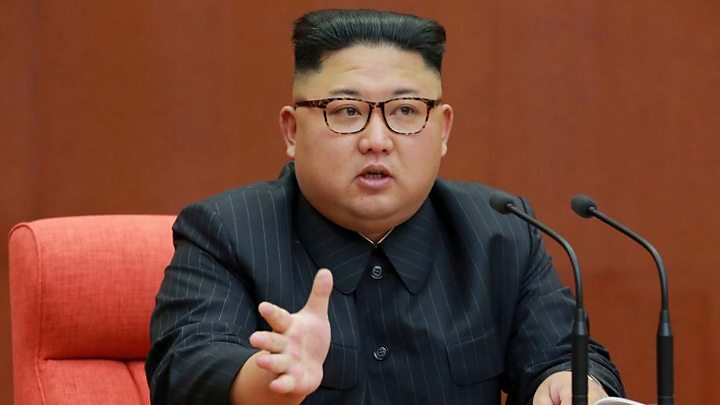 He also reiterated Japan's policy to pursue "real peace" in the region and said if North Korea "is willing to take steps" in the right direction it has a "bright future ahead". Mr Abe's visit is part of a flurry of diplomatic activity in the run-up to the summit, as countries try to ensure their interests are not overlooked. Mr Kim has also had two meetings with South Korean President Moon Jae-in, who in turn has visited Mr Trump in Washington. In an indication that China is still a key player in the relationship, Mr Kim has also made two trips to Beijing, meeting President Xi Jinping.